If you’re into audiobooks (ex. 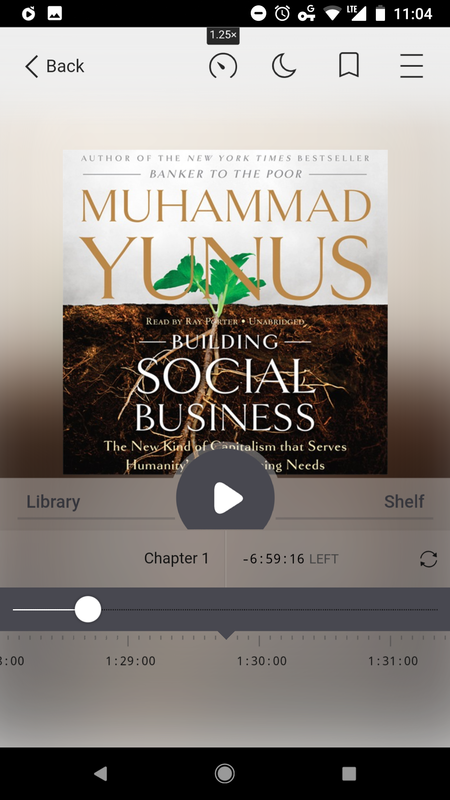 Audible) or ebooks (ex. Kindle) you should check out Libby. It lets you download both formats of books from your library for free. Hennepin County at St Paul public libraries both appear to use it (I’ve only tried it with Hennepin). I just plugged in my library card number and PIN to get started. There isn’t an unlimited number of copies of the downloads so you may need to put a hold on some titles. It also allows you to filter for books available for immediate download. And, like audiobooks and ebooks in general, not every book is available in every media format. 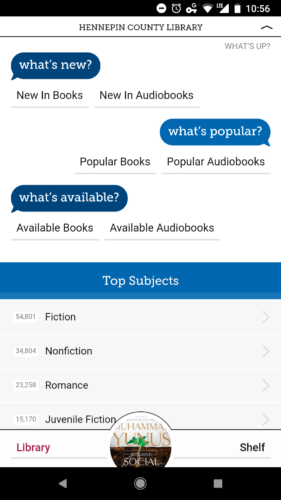 For ebooks, you can search Libby for an ebook, then have it download your Kindle or the free Kindle app (which you can download for free to your phone, tablet, computer, etc. from your app store). Here is an example of a decent idea with marginal execution. A company called BookTour.com manages a directory of media contacts, including bloggers, who may be interested in reviewing books. They call this their Pressfinder service. The site uses a freemium model where authors can make a limited number of directories queries for free, then are asked to cough up $30 for unlimited access to the directory. So far, this seems like a solid service. Authors would love a service that helps them find people who are willing to read then write about their books. However, what if the media contacts in the directory weren’t media members willing to read then write about books from random authors? Unfortunately, that’s been my experience with the service as a media contact. 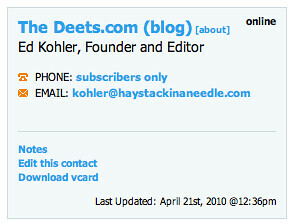 My blog has been listed as a media contact for Minneapolis. Why is that a problem? Because I have no interest in reviewing books from random authors. It creates unsolicited emails to me from authors who are bound to be disappointed. But, the bigger issue isn’t my lack of interest in receiving more email. It’s the deceptive nature of BookTour.com’s directory for authors. Many of BookTour.com’s features are free for authors, but they charge authors for access to the Pressfinder service. At a glance, it looks like BookTour.com has a relatively large directory of media contacts, which may entice authors to cough up $30 to gain access to the complete list. But if BookTour.com’s Pressfinder directory is padded with unsolicited media contacts, how to authors benefit? BookTour.com has never contacted me, but overly optimistic authors using Booktour.com have. This sounds like a Win-Lose-Lose deal to me, where Booktour.com makes money at the expense of my time and their author clients’ time. [On a 1-7 scale, the] iPad, Kindle, and the printed book all scored fairly high at 5.8, 5.7, and 5.6, respectively. The PC, however, scored an abysmal 3.6. I completely agree with the PC based book reading experience as it exists today. The Kindle for the Mac is surprisingly unusable compared to actual Kindles, Kindle for iPhones/iPod Touches, or Kindle for Android devices. Plus, it’s very difficult to read a book when there are so many other distractions on a computer. Nielsen’s tests suggest that people can read faster on books in printed form. However, I think that result will vary tremendously based on how familiar people are with reading on an electronic device. Also, picking the most comfortable font size, font face, brightness, and contrast will make a huge difference. A person with poor vision will clearly have better luck reading on a device where they can blow up the text to something easier to read. In my own case, I’m sure I can read more effectively on my Kindle for Android app than I can in book form. Why? Because I get around to doing 90% of my book reading either in the dark, or at times when I don’t have a printed book with me. I had a chance to catch up on some reading while on vacation. Here are a few things I’ve enjoyed. Whole Earth Discipline by Stewart Brand. Brand takes what he calls a pragmatic look at common environmental debates and provides perspectives that really do seem pragmatic compared to the polarized views that make it into the media. Issues such as energy strategies, bioengineering food, and the evolution of immigration and poverty each made this worth reading for me. Highlight: Hearing the left’s fear of science when it comes to genetic engineering of crops compared to the right’s fear of science when it comes to stem cell research. Lowlight: It’s pragmatic. No easy fixes to our problems. However, it does point people in smart directions, so this isn’t much of a lowlight. History of the United States, 1492 – Present by Howard Zinn. I’ve actually been reading this book for years. It’s the book I carry with me when traveling for times when my iPod Touch has died or I’m on a plane where they won’t let me use it (eg. you can’t use any electronics while in the air on Atlas Jet). Zinn takes a look at pretty much every major event in US history going back to the “discovery” of America, but puts a twist on things. While history is normally written by the winners, Zinn twists that and tells the stories from the perspectives of Native Americans, the working class, minorities, and other groups who’ve been along for the ride, but haven’t really been setting America’s agenda. The work by people in power that’s gone into building public support for the wars America has fought has been particularly interesting. Has the grassroots ever lobbied a reluctant government to go to war? It doesn’t look like it. Highlight: Perspectives on how wars were sold to the American people, when labor organizing was effective (and what the government did about that), and how America’s Native Americans were screwed, screwed, and screwed, were all well presented. Lowlight: Many of the wage citations lack context. When Zinn says that someone earned x dollars per week in 1866, it’s hard to understand how ridiculous it is since I’m not as close to that type of data as Zinn clearly was. I also question many of his perspectives on farmers being driven off their farms. While mentioning that farming became rapidly more efficient in terms of yield per acre and per man hour, he then blames he mills, railroads, etc., for farmers being unable to make a living off their land. However, it seems like basic economics explains much of it: There are less farmers needed to create the same (or even more) food than there used to be due to a wide variety of efficiency improvements over time. While it would be nice if people could make a living farming a small piece of land, that’s less and less likely outside of boutique farming. Gang Leader for a Day by Sudhir Venkatesh. If you’ve read Freakonomics, you’ll be familiar with Venkatesh’s work where a chapter is devoted to it. He essentially embedded himself with the Black Kings gang within the Robert Taylor Homes in the early ’90’s while in grad school at the University of Chicago. A very interesting read. If you like the show The Wire, you may find this interesting because it looks at gang structures, chain of command issues, and dealing with corrupt cops, among other gang related issues. Highlight: It does a great job explaining how people who have to deal with the system on a regular basis have no faith in the system. Corruption in public housing, police, elections, etc. are so blatant that they have extraordinarily low expectations from government. Lowlight: This is not a how-to on how to start your own crack business. After a couple glasses of wine, we found this particularly funny. 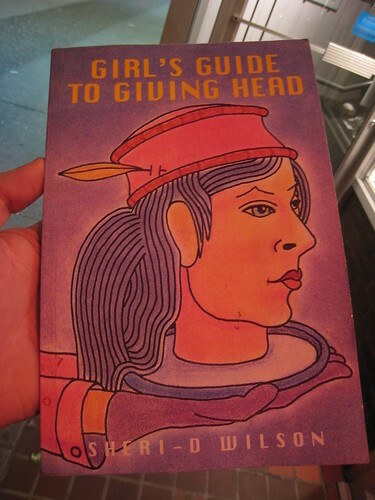 What kind of book on giving head has a cover image like that? I hopped outside to take a closer look. Strangely, the book was filled with religious poetry. One of the cool things about visiting a bricks & mortar book store is the browsing. You never know what you’ll run into in the aisles. 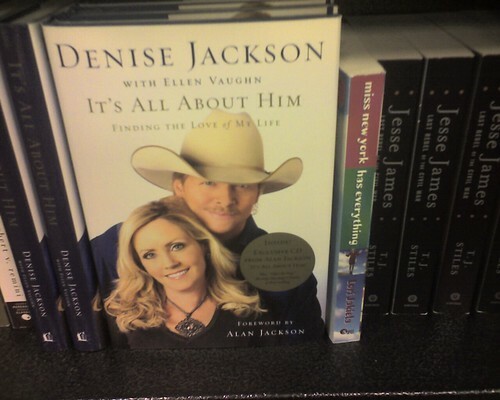 For example, I found an intriguing book written by the wife of country singer Alan Jackson that I hadn’t heard of before. We don’t practice “traditional family values” like that around the Kohler household. Unfortunately, I can’t remember how I ended up here, but regardless, it’s worth checking this out. Garrick cites Seth Godin on this. Sounds right. Grand Canyon is Only 6,000 Years Old? “In August 2003, Park Superintendent Joe Alston attempted to block the sale at park bookstores of Grand Canyon: A Different View by Tom Vail, a book claiming the Canyon developed on a biblical rather than an evolutionary time scale. NPS Headquarters, however, intervened and overruled Alston. To quiet the resulting furor, NPS Chief of Communications David Barna told reporters and members of Congress that there would be a high-level policy review of the issue. We wouldn’t want to offend people ageologists (people who don’t believe is geology) by pulling book that supports their ageological opinions over facts, would we? Author Ed KohlerPosted on January 1, 2007 September 4, 2018 Categories Books, Creationism2 Comments on Grand Canyon is Only 6,000 Years Old?